Gearing up for the annual Festive Season concert simply titled Christmas, the Drakensberg Boys Choir is ready to take to the Pietermaritzburg City Hall stage on December 4, 2018. 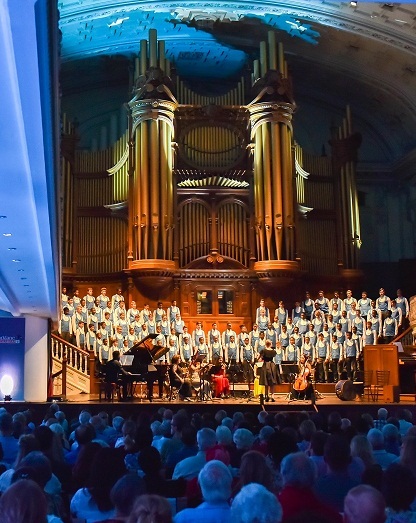 Having recently won the 2018 World Choir Games, this concert will see the Drakensberg Boys Choir, over 100 voices, conducted by Artistic Director Bernard Krüger and Tobias Stückelberger on stage. The choir will be accompanied by official accompanist Lubabalo Dyasi at the console of the historic and much-loved City Hall organ, and at the piano. As has become a Pietermaritzburg tradition, the audience will be invited to join in the singing of carols. In a performance of seasonal numbers, the choir include O come, o come, Emmanuel, O Holy Night, Silent Night and the rousing Afro-Renaissance Christmas Celebration. The Christmas concert takes place at 19h00 on December 4. There will be secure, patrolled parking in the City Hall, Tatham Art Gallery and Bessie Head Library precincts on the evening. Tickets are available online at ticketpros.co.za or at PayZone at Parklane SUPERSPAR. Christmas sponsored by Parklane SUPERSPAR in association with the City of Pietermaritzburg, Music Revival, CPW Printers, and The Witness.